Smart Ones is a free browser add-on for online shoppers who want to quickly access the best online offers and deals. The program is advertised at smartonestheword.com, which features no installer, which means that the program is available on some different websites. Hence, it is essential to be careful with any freeware program because the installer of the program may offer additional, mainly optional, programs. If you do not know the characteristics of the program and the way it works, do not install it in order to prevent adverse consequences related to your privacy and security. Smart Ones displays third-party advertisements none of which is reviewed and endorsed by Smart Ones. As a result, our researchers have categorized Smart Ones as adware, and we recommend that you remove this program from the computer. Smart Ones is based on the JustPlugIt platform, which was used to create programs such as Cheap Coupon, LionSales, SaleMaker, and many other programs displaying third-party advertisements. The majority of the programs based on JustPlugIt have their official websites that seem to be aimed at convincing the user that the program is reliable and safe to use. Smart Ones shows pop-up advertisements, web banners, and other advertisements on multiple websites, mainly shopping websites such as walmart.com, ebay.com, bestbuy.com, and many other websites. Some of the advertisements displayed feature the label ‘Powered by Smart Ones’, and you may also find pop-ups labeled ‘Powered by RightCoupon’. Note that RightCoupon is another advertising-supported browser add-on based on the JustPlugit platform. Below you will find our step-by-step instructions that should help you uninstall Smart Ones, but we suggest using a reputable security program that can both removed Smart Ones and safeguard the system against various computer threats. We recommend using SpyHunter because this program successfully eliminates Trojan horses, fake anti-virus programs, browser hijackers, rogue anti-virus programs, and many malicious programs that can infect the computer at any time. Move the mouse pointer to the lower-left corner of screen. 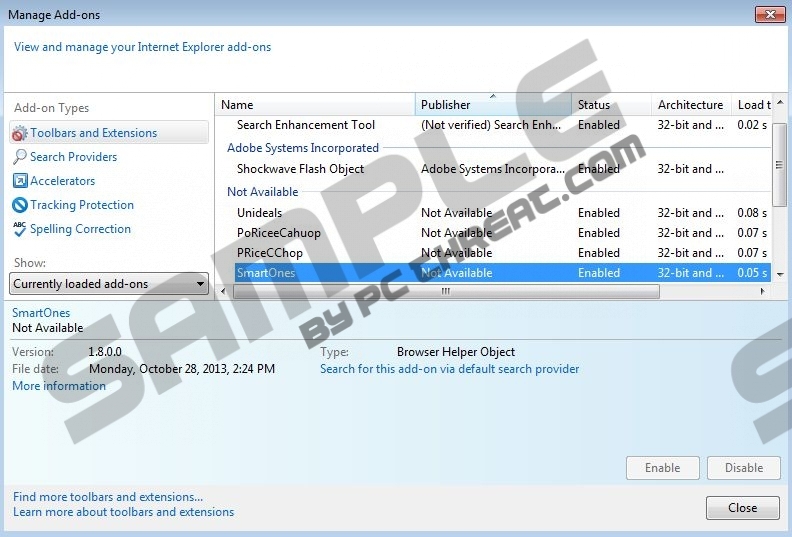 Smart Ones is an adware program, and we recommend that you remove it from the computer. If you have already uninstalled it and want to make sure that no malicious files are present on the PC, use the scanner available below. Quick & tested solution for Smart Ones removal.